“With an asking price of $33 million, it is the most expensive concrete box in Canada. The “Super Penthouse” at the Trump Toronto hotel, in the city’s Financial District, spans three floors and has panoramic views of the city from 58 storeys up. With 11,755 square feet of space, it is several times the size of the average Canadian home. And then there’s the 2,091-square-foot wrap-around terrace. 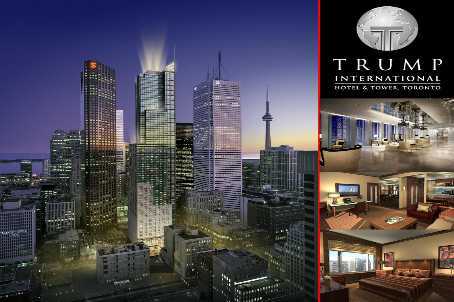 The empty penthouse would make a perfect party space for the upcoming Toronto International Film Festival. The hotel side is already preparing two large private apartments on a separate floor that will be used for VIP guests. At 2,400 square feet, the apartment will rent for $10,000 per night. Few homes are quite like the penthouse at the Trump. The unit’s $2,800 per square foot cost is a steep premium to pay for any buyer, since the ultra-high end market for condominiums is closer to the $1,000 per square foot range. But the Four Seasons Toronto sold its 9,038-square-foot penthouse in 2011 for $28 million, or $3,098 per square foot.